This entry was posted in Homeowners Insurance on 12/14/2016 by admin. There are plenty of things that you probably do to protect your home throughout the year, from repairs and upgrades to reviewing relevant homeowners’ insurance quotes online. During the holiday season, unique hazards often come with holiday decorating, both inside and outside of your home. Avoid common dangers while preparing your home for the holiday season so your family and you home are protected. Here are four tips to make holiday decorating safe this year. Since you will only use them for a few weeks out of the year, you might be tempted to buy the low-quality holiday decorations. But with candles and electrical hazards such as lights and outlets, in the mix, opting to pay extra for safer decor will be worth the additional cost. Replacing old lights with LED versions inside and out will keep your lighting from heating up and becoming a fire hazard. The U.S. Fire Administration points out that December is the peak time for candle fires in homes. If you can, skip candles completely and opt for flickering lights that are designed to look like the real thing. Source the best extension cords and power strips for your needs as well. Bringing a real tree into your home poses a few potential risks that should weigh into your decision making. A dry tree can be a fire hazard so, especially if you get your tree early in the season, be sure to keep up on a consistent watering schedule. If you go to a cut-your-own tree farm, there might be stowaway spiders and other bugs that you didn’t plan to invite for the holidays. Inspect your tree well before bringing it indoors, and hose it down to get rid of critter nests and insects that might make their way into your home otherwise. 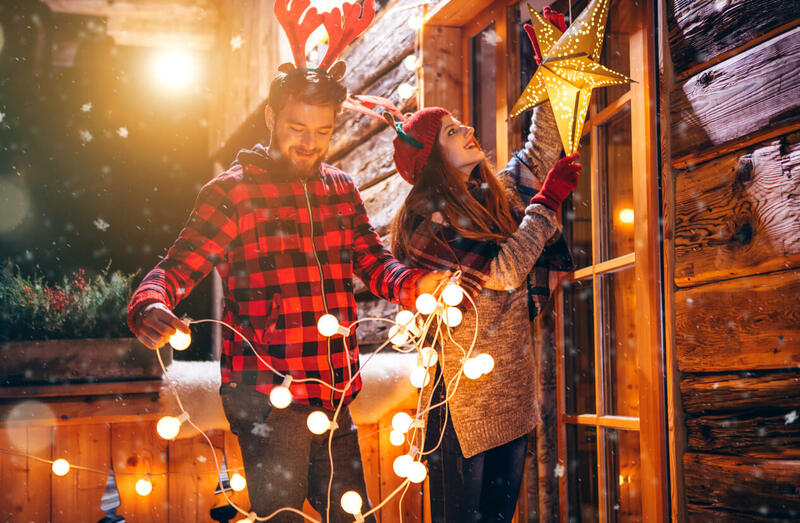 While keeping your home safe and free from potential dangers around the holidays is important, your personal safety, as well as that of any family members helping with decorating, should also be a priority. If you aren’t great at electrical work or are clumsy on a ladder, don’t go overboard with exterior decorations. Pick decor you can handle putting up yourself, or hire others to help with your setup. Keep an eye on kids who are helping and never leave them unattended around live electrical wires or ladders. You might want to wow your family and neighbors with your decor, but don’t risk your safety in trying to do so. When you bring out your decorations from the attic, basement, or crawlspace, keep your safety in mind. Storing decorations in an out-of-the-way space might seem like a good idea, but if these areas are too hard to access you might set yourself up for injuries. Maybe choose a more accessible area in the future. Also, rather than using cardboard boxes and grocery bags to store your holiday items, use durable plastic bins to keep your decorations free from mold and critters that could be hazardous in your home. Getting ready for the holidays can bring along with it fun activities for the whole family. It is important that you keep both your home and your loved ones safe this holiday season, and that includes your holiday decor. Another way to protect your home year-round is by comparing homeowners’ insurance quotes online, so you can rest assured you have the right insurance in place for your needs. The average cost of homeowners’ insurance is much more affordable than the cost of unexpected emergencies in your home. Be sure you are prepared if any home repairs come up or if loved ones have an accident in your home this holiday season.